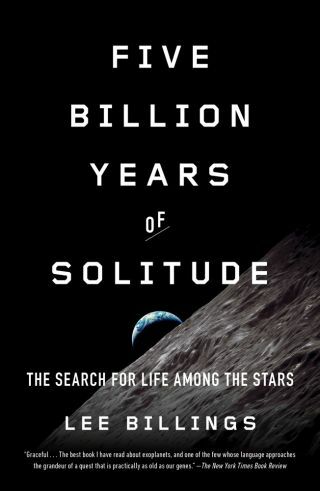 "Five Billion Years of Solitude," by Lee Billings. Lee Billings told Space.com in an interview that he was tired of reading books about exoplanets and finding that they only talked about the search for intelligent life at the very end. "I just got so sick of that! That's not the end. That's the beginning! That's the whole basis for everything we're doing," he said. So Billings set out to write his own book: the book he wanted to read. Lee Billings, author of "Five Billion Years of Solitude: The Search for Life Among the Stars." On July 13, 1963, just off the Cabrillo Freeway in San Diego, a time capsule was sealed in a small subterranean concrete vault beneath what was then the west entry ramp into the General Dynamics Astronautics plant, where the company built Atlas rockets for the U.S. government. General Dynamics was bought out in the 1990s, and much of its Atlas-manufacturing infrastructure was dismantled to make room for easier money from industrial parks and office buildings. The capsule, meant to be unearthed a hundred years after its burial, was instead dug up and relocated to storage at the San Diego Air & Space Museum in Balboa Park. If you were to open the capsule today, you would find a slim, aged volume entitled 2063 A.D. The book had been commissioned to commemorate General Dynamics's fifth anniversary, and contained hopeful prophecies from experts — generals, politicians, scientists, and astronauts — about humanity's conquest of space a century hence. Someone at the company thought to print a few hundred extra copies, which is how we know about the book's contents today. Mercury astronaut John Glenn, the first American to orbit the planet, predicted that within a century we would have linked atomic power plants to "anti-gravity devices," fundamentally rewriting the laws of physics and revolutionizing life and transportation on Earth and in the heavens alike. Another Mercury astronaut, Scott Carpenter, ex- pressed his hope that the anti-gravity "scheme" would help humans colonize the Moon, the Martian moon Phobos, and Mars. The prominent astronomer Fred Whipple suggested that Earth's population would have stabilized at 100 billion, and that planetary-scale engineering of Mars would have altered the Red Planet's climate to allow its 700,000 inhabitants to be self-sufficient. The director of NASA’s Office of Manned Space Flight, Dyer Brainerd Holmes, suggested that in 2063 crewed vehicles would be reaching "velocities approaching the speed of light," and that society would be debating whether to send humans to nearby stars. A majority of the twenty-nine respondents predicted a peaceful world, harmoniously unified under a democratic world government and freed from resource scarcity. Each entry had its optimistic idiosyncrasies. Edward Teller, one of the masterminds behind the hydrogen bomb, hoped that ballistic missiles would no longer be used to loft nuclear-tipped warheads, but would instead be turned to transporting passengers anywhere in the world in less than an hour. He doubted, however, that it would ever be "a comfortable way to travel." Vice President Lyndon B. Johnson opined that we might use satellites to control Earth's weather. The Republican California congressman James B. Utt thought that society would master the science and technology of human teleportation, though he didn't "look forward to this with any sense of enjoyment." Another California congressman, the Democrat George P. Miller, offered his curious opinion that by 2063 we would "have found humans living elsewhere in the universe besides Earth." The strangest entry of all was the long, decidedly pessimistic response of Harold Urey, the Nobel-laureate chemist. Where few other contributors had filled more than a single page, Urey took up roughly a third of the entire book. His thoughts may well have been inspired by his participation in Frank Drake’s Green Bank meeting two years earlier. Urey hardly discussed space science and exploration at all. Instead, he devoted much of his essay to summarizing the social implications of changes he had seen in his lifetime. He had been a boy at the turn of the century, growing up when steam engines, railroads, telegraphs, and telephones represented the pinnacle of technology. He was now an old man, in a world filled with automobiles, airplanes, rockets, digital computers, color televisions, and atom bombs. He lamented how technological progress had cut off his children from many of the bucolic joys of his own upbringing, such as riding "in a sleigh behind a matched team of blacks, on a clear night with stars above and white snow around . . . nestled warm and cozy beneath a buffalo robe." For every decade of Urey's life, human society had experienced a relatively constant factor of growth in technological capability and economic capacity. The expectation of continued growth—indeed, endless growth — was what underpinned capital investment in the ongoing research and development that was transforming the globe. But that exponential profusion, he wrote, was not opening up magnificent new frontiers so much as it was revealing previously unappreciated limits. Looking ahead, Urey glimpsed a not-too-distant future in which things could fall apart, when the centers of the modern world could not hold, a time when growth would stagnate. He postulated no proximate causes other than already-existing cracks in civilization’s façade. Schemes for world government were unfavorable, he believed, because governments tended to grow bloated and cumbersome from "fantastic national debt." The ruinous deficits would be produced by "the curious psychology of politicians" paired with "the development of war machines by applied scientific methods," and would be exacerbated by the need to provide healthcare and social security for a large, aging populace. Turning society over entirely to the whims of large, private corporations was no alternative, Urey observed, because companies would inevitably conspire to pursue short-term profits against the public interest and common good. Only through some uneasy and uncertain balance between government regulation and private enterprise could the status quo of growth be maintained. Even then, it could not be maintained indefinitely. Urey bemoaned the fact that most ordinary people were trapped in the present, scarcely able to consider a past predating the lives of their grandparents, unable to plan for a future beyond the lives of their grandchildren. Worse yet, he saw a public increasingly hostile to any scientific research and technological development that did not directly contribute to greater comfort and convenience in their daily lives. In developed nations, more effort than ever before was being channeled away from solving pressing global problems and toward making technological baubles to satisfy the cyclical desires of consumerism. Urey noted that U.S. fossil fuel consumption had increased eightfold between 1900 and 1955, much of it due to generating electricity. Further, usage of "electrical power increased from negligible in 1900 to about five hundred watts per person" by 1963. How long could energy usage continue increasing to support economic growth? In one of the few actual predictions to be found in Urey's response, he gently hinted such luxuries were unsustainable: well before 2063, he prophesied, we would be faced with the potentially unpleasant necessity of finding "ways to expend human energy other than by working on useful gadgets." Energetic limits to economic growth are remarkably straightforward to calculate, given a few simplifying assumptions. Taking the United States as an example, data from the federal Energy Information Administration shows that the nation's total energy usage has grown by just under 3 percent per year since the middle of the seventeenth century. As a thought experiment, a UC San Diego professor, the physicist Tom Murphy, has calculated the consequences of that continued growth out into the future, extrapolating it to the entire globe and reducing it to 2.3 percent per year, which yields a factor-of-ten increase in energy usage every century. Starting from a circa 2012 global energy use of 12 terawatts, the world of 2112 would consume 120 terawatts, and the world of 2212 would consume 1,200. By 2287, world energy consumption would be 7,000 terawatts — an amount that could in theory be delivered by covering all the land on Earth with photovoltaic solar-power arrays operating at 20 percent efficiency. From there, increasing the efficiency of the photovoltaics to a miraculous 100 percent and covering the oceans as well as the continents would allow the 2.3 percent annual growth in energy use to persist for another 125 years, taking our steadily growing civilization into A.D. 2412 before it outpaced the total amount of sunlight falling upon the Earth. Another energy source, nuclear fusion, could potentially sustain an annual 2.3 percent growth rate for some centuries beyond this, at least until the waste heat from the vast amount of power being produced evaporated the oceans and turned Earth’s crust to glowing slag. For a planet-bound civilization, the boiling point of water and the melting points of rock and metal place insurmountable limits upon the expansion of energy use. Writing in the journal Science in 1960, the physicist Freeman Dyson carried humanity's recent, relentless energy consumption to its logical extreme, postulating that someday if we mastered living and working in space we could harness essentially all of the Sun’s light by constructing a cloud of solar collectors around our central star. Dyson didn't sweat what he saw as relatively minor technical details, such as how we would acquire the vast amounts of necessary raw materials — he proposed that by the time we needed all the Sun’s energy, we would be more than capable of simply dismantling a planet or two. Viewed from light-years away, the Sun's optical emission would fade and be replaced by the infrared glow of waste heat emanating from its enclosing shell. If astronomers ever saw a distant star characteristically dim and shift entirely to infrared emissions, Dyson wrote, they would most likely be glimpsing evidence of another energy-hungry galactic civilization. Operating with perfect efficiency, such a "Dyson sphere" would capture some 400 billion petawatts of power — the total radiant output of the Sun. And yet, based on an ongoing 2.3 percent annual growth in energy usage, Murphy calculated it would cease to meet our expanding energy needs in just less than a millennium. There are, of course, a few hundred billion stars in the Milky Way. Assuming humanity somehow managed to instantaneously encase each and every Sun-like star in the Milky Way within perfectly efficient Dyson spheres, the inexorable 2.3 percent increase in energy used per year would still bring us to the limits of our galactic capacity within another millennium. "Thus in about 2,500 years from now, we would be using a large galaxy's worth of energy," Murphy has written. "We know in some detail what humans were doing 2,500 years ago. I think I can safely say that I know what we won't be doing 2,500 years hence." If technological civilizations like ours are common in the universe, the fact that we have yet to see stars or entire galaxies dimming before our eyes beneath starlight-absorbing veneers of Dyson spheres suggests that our own present era of exponential growth may be anomalous in comparison not only to our past, but also to our future. Reprinted from "Five Billion Years of Solitude: The Search for Life Among the Stars," by Lee Billings, with permission of Current, a member of Penguin Group (USA) LLC, a Penguin Random House Co.